Anyone who has lived in or visited the Olympia area can quickly see this is a bike friendly town. With multiple bike lanes, routes and many cycling groups, Thurston County is home to thousands of cyclists. If you are one of them, you have probably had that moment when you realize your bike tire is low or your chain is squeaking halfway into your morning commute or afternoon ride. Residents and fellow cyclists, Chris Schneider and Ingrid Gulden, know this scenario all too well. 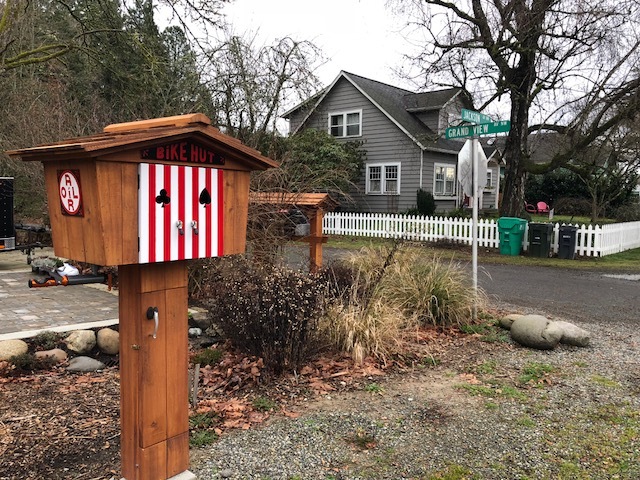 So when the couple purchased a property on the west side of town, along one of Thurston County’s designated Bike Routes, the solution was easy. I will be honest and say I am not big on biking, so I did not know what to expect when I pulled up to their “Bike Hut.” The idea for the name came from something Chris discovered on one of his own rides in a very remote area of California, right at the bottom of a long climb. There lies the original Bike Hut where cyclists can stop in, make repairs, grab a snack and prepare for the next leg of their journey. Although they needed to scale things down a bit, Chris and Ingrid applied the same principle. “It’s a little red barn with red and white striped doors. Anybody that knows the Bike Hut in San Mateo, California, will immediately recognize the similarities,” Chris explains. 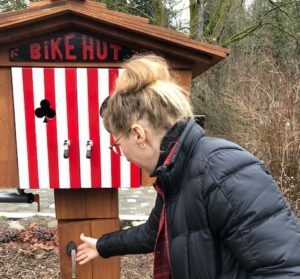 Ingrid tells me how at first, many people mistook the Bike Hut for one of the free little libraries around town, and it is easy to see why since it has a similar design. However, their idea is catching on and more people are realizing what the Bike Hut is. Instead of books, cyclists will find a bottle of chain lube, rags, a gauged floor pump, spare inner tubes, a ball inflator, basic hand tools and a first aid kit. As you can see, it has many of the little things you might not carry with you on a ride, but that can be very much needed. And, it is not just for cyclists; pedestrians are welcome too. Chris and Ingrid hope everyone will feel comfortable using it for whatever their needs may be. The two created the Bike Hut for many reasons, but most importantly, it was to encourage a sustainable form of transportation. “I wanted to build it as a thank you to the cycling community for being carbon free and making healthier choices,” Chris explains. “We have strong feelings regarding the use of appropriate technology,” such as calories per mile per pound of body weight. “A person riding a bicycle is literally the most efficient form of locomotion on the planet. It’s like getting 980 mpg,” Ingrid adds. The Bike Hut is also a unique way to bring like-minded individuals together. “We see lots of pedestrians and lots of cyclists, but they aren’t seeing each other. They might not realize what a community they are a part of,” Ingrid explains. Located on the corner of Jackson and Grand View, just two blocks north of Harrison Avenue as you start up the Harrison Hill, the Bike Hut can serve pretty much everyone traveling by bike from downtown to the Westside. This designated Bike Route is just one of many in Thurston County created to give cyclists a better route to travel with less traffic. Ingrid shares how the Bike Hut will continue to evolve and they plan to do some more landscaping along with making water available for hot summer days. “It’s a work in progress, but we hope it just sort of becomes something that’s in your bank of knowledge. I know where to get a cup of coffee and I know where to pump my tire up,” she says. And who knows? 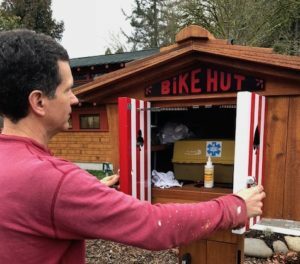 Maybe Chris and Ingrid’s idea will catch on and Bike Huts will start popping up all over town, assisting travelers, supporting our environment and building community at the same time.